He's the CEO of a major financial institution. He's also hiring a financial analyst. Your resume is there, in his computer. But, bad news. It's buried by 300 others, all alike. You already know it's very, very hard to get a job as a financial analyst. It's one of the fastest growing fields in the U.S., but the competition is growing even faster. To get in through the door, you'll need the best financial analyst resume on offer. A financial analyst resume example better than 9 out of 10 other resumes. How to write a financial analyst resume that will land you more interviews. Tips and examples of how to put skills and achievements on a financial analyst resume. How to describe your experience on a resume for a financial analyst to get any job you want. Here's a sample resume for a financial analyst made using our resume builder. Financial Analyst Resume Example - See +20 resume templates and create your resume here. What's the Best Format for a Financial Analyst Resume? That's how much time the average CEO spends looking at a resume. You need to sell your best features right away. The reverse chronological resume format will do just that. It's the best format for a financial analyst resume because it gets your best points across fast. Maximize the effect with eye-friendly fonts, easy-to-parse headings, and strategically placed white space. Finally, save it as a PDF. 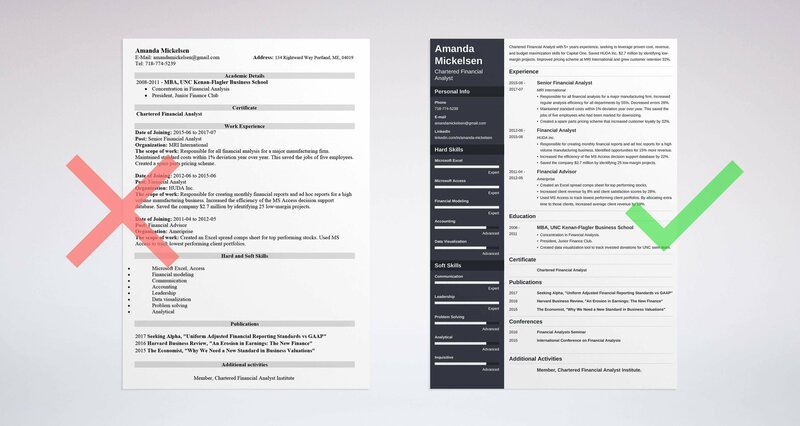 Other formats can scramble your resume layout, but a PDF will preserve your FP&A resume intact across multiple platforms. Want to make sure your resume will hook every recruiter and get you that interview? Get our free checklist and learn what makes a job-winning resume: 46 Things You Need To Do Before You Send Your Resume. Pro Tip: Double-check the job listing to make sure the company accepts PDF resumes. PDFs can clog some Applicant Tracking Systems. Want to explore other formats for a financial analyst resume? See this guide: "3 Resume Formats: How to Choose the Best One [Examples]"
The one with the stock incentives, an on-site fitness center, and a sky-high financial analyst salary. It's also the one with 350 financial analyst resumes on the recruiter's laptop. How can you stand out? Answer: with a well-crafted FP&A resume summary or resume objective. Because they're the hook that makes the manager say, "I must read more." Use a resume summary when you've got Peter Lynch-level experience. Use a resume objective when you're just starting out, or switching career paths. Let's start with the resume summary. Look at the very different senior financial analyst resume examples below. Can you spot the flaw in the first of these two finance analyst resume samples? Financial Analyst with 5 years experience, seeking position with Capital One. Proven skills in cost analysis, budgeting, and pricing. What's the fatal flaw in that resume summary? It's generic. It reaches right in through the portfolio manager's eyes and triggers a yawn. Chartered Financial Analyst with 5+ years experience, seeking to leverage proven cost, revenue, and budget maximization skills for Capital One. Saved HUDA Inc. $2.7 million by identifying low-margin projects. Improved pricing scheme at MRI International. Grew customer retention 32%. The yawns have left the building. Now let's say you don't have experience as a financial analyst. Check out the next two financial analyst resume samples. Resume objectives work for applicants with no experience. Entry level financial analyst. Currently a financial advisor looking to switch careers. Highly skilled in cost analysis, budgeting, Excel, and MS Access. Is that terrible? No. But the example below makes more sense. Entry level financial analyst with two years experience as a financial advisor. Created an Excel spread comps sheet for top performing stocks that increased client revenue 8%. Used MS Access to identify and improve on low-performing portfolios. Increased average client revenue by 19%. Who's that, right? It's the next Harry Brown or George Soros. Dig through your work history and find achievements like this that sell your best features. Pro Tip: Still coming up blank for experience? Target an easier job. Some firms will train financial advisors on-the-job as analysts. You didn't get the job. It's not because you lack experience. You just didn't show it correctly. First, make a list of your achievements. All of them. Second, read the job offer carefully. Pay close attention to the skills and abilities the recruiter wants. Third, prove you have those abilities. Troll your long list for wins that match the job offer. Responsible for all financial analysis for a major manufacturing firm. Increased regular analysis efficiency for all departments by 55%. Decreased errors 28%. Maintained standard costs within 1% deviation year over year. This saved the jobs of five employees who had been marked for downsizing. Created a spare parts pricing scheme that increased customer loyalty by 32%. Details like those will give a recruiter that Carl Icahn feeling. Responsible for regular financial analysis. Tasked with maintaining standard costs. Created a spare parts pricing scheme. That won't turn any heads. It almost screams, "Me too." Now, what about if you don't have any experience? If you don't have experience, even the best resume in the world won't get you a job as a financial analyst. So how do you get a job? Take heart. Other people got in, and they didn't always have experience. So it's not like there's some magic force dome keeping out the newbies. There are three ways to get a job as a financial analyst if you have no experience. The first way to get experience for a financial analyst resume is to dig into the achievements you already have (but don't know it yet). Look at job offers online. Look at the required skills. Then dig back into your past and find achievements that prove you have those skills. Created monthly financial reports. Found and eliminated recurring errors, saving the company 3% in waste per year. Built data visualizations that showed how we could increase revenue by 15% by re-prioritizing construction projects. Analyzed cash flow of company gift shop. Updated inventory to add more popular products. Increased store revenue by 38%. The second way to get experience for your financial analyst resume is to build it. Take on some small projects, free, or as a freelancer. There's a site called Zursh that hires short-term financial analysts and researchers. Get a small project or two on there, then use it to beef up your flimsy resume. Can't find even free work? Invent a couple one-off financial modeling projects. Do a few company valuations or financial ratios, or a comp spread or two. Whatever small projects you do, put them in an online portfolio. Not sure how to make an online portfolio for a financial analyst? Read this guide: "How to Make a Professional Website: Complete Guide + 9 Tips"
This next way to get resume experience is actually a textbook case for how to become a financial analyst. Apply to a major retail investment company like Fidelity, Edward Jones, or Ameriprise, but not as a financial analyst. Instead, apply as a Financial Advisor. Why? It's a sales job. That makes it easier to get. Next, take advantage of on-the-job financial training and licensing. This third route takes the longest, but it'll give you plenty of financial analyst experience for your resume. In the first of our financial analyst resume examples, we've got a real dud. This candidate proves only that she's interested in the job. Financial Analyst Experience: This is my first attempt at entering the financial analyst world, but I'll take a reduced salary for on-the-job training. If a recruiter reads that financial analyst resume experience list, he'll move on to the next candidate before you can say "Book Value." Created an Excel spread comps sheet for top performing stocks. Increased client revenue by 8% and client satisfaction scores by 28%. Used MS Access to track lowest performing client portfolios. By allocating extra time to those clients, increased average client revenue by 19%. Regularly created financial analysis ratios to compare different investments. That's a Harry Markopolis-worthy resume. A Peter Thiel-style experience list for a financial analyst who knows her way around a cash flow analysis. Yet it isn't too difficult to build an experience section like that. Pro Tip: Attend networking events and seminars, and join a professional association like the Association of Finance Professionals. The Chartered Financial Analyst Institute is another good resume builder. You'll grow your knowledge base and gain invaluable opportunities for resume experience. Did you see how the second financial analyst sample resume used some powerful action words? Get your own from this guide: "+80 Examples of Resume Action Words for Every Profession"
Education matters for a financial analyst. But a bachelor's, an MBA, or a Masters in Finance is not a golden ticket. But used correctly, it can get you in the door. Let's start with a real financial analyst job offer. It values leadership, data visualization skills, and financial modeling experience. Now look at two finance analyst resume samples. Not exactly Jack Bogle. By now, our CEO is playing with his Newton's Cradle. Click, click, click. Created data visualization tool to track invested donations for UNC swim team. Why does that catch Richard's eye? Because you've used the most basic attention-grabbing trick of all. You've made it about him. More specifically, you've made it about what he's interested in. And all it takes is a little thought. A little fitting to make your financial analyst resume hug the curves like a custom-tailored Kiton. Pro Tip: For concrete advice on how to form-fit your resume to each financial analyst job listing, check out our guide on how to customize a resume. To get the best ROI from your financial analyst resume education section, see this guide: "How to Put Your Education on a Resume [Tips & Examples]"
Let's get back to our CEO, Richard. In fact he works 16-hour days and gets less sleep than his employees. He doesn't have time to look at every financial analyst resume. He solves that with an Applicant Tracking System that gives him only the resumes with the right financial analyst skills list. How can you have the right skills list? Look at two more senior financial analyst resume examples. Problem solving, communication, data gathering, MS Excel, MS Access, Leadership. See? Generic. Worse, it's missing skills. Leadership, financial modeling, accounting, finance, MS Excel, MS Access, data visualization, communication. Because it lists the skills in the job offer. Plus, it adds some other skills the CEO might like. The real trick thought is to weave the skills into the experience section. Responsible for creating monthly financial reports and ad hoc reports for a high volume manufacturing business. Identified opportunities for 15% more revenue. Increased the efficiency of the MS Access decision support database by 22%. Saved the company $2.7 million by identifying 25 low-margin projects. Used Excel daily to perform data gathering, business performance analyses, trend analyses, and other financial analysis tasks. That's the real recipe for getting a CEO to notice your financial analyst resume. Use the same strategy with your education and "other" sections. But don't lie. Most interviewers can uncover fake skills quickly with a few pointed financial analyst interview questions. And what is a financial analyst without ethics? The table below lists some important financial analyst resume skills. Need help finding more skills keywords for your financial analyst resume? Look through several job offers online. If you use this custom skills method as a foundation for your resume, you'll have CEOs and recruiters tripping over their Bostonians to hire you. Pro Tip: Are you a buy-side, sell-side, or internal corporate analyst? Each will have a very different financial analyst resume skills list. That's yet another reason to read the job offer carefully. For more tips on how to put financial analyst skills on your resume? See our guide: "+30 Best Examples of What Skills to Put on a Resume (Proven Tips)"
Certifications aren't important in a resume for a finance analyst. The Chartered Financial Analyst (CFA) certification is the heavyweight. It takes four years of work experience and a three-part, grueling exam. If you're chartered, you definitely want to highlight it. You can put them in a special certifications section. If you're a CFA, always list that first. The Financial Industry Regulatory Agency (FINRA) handles all licensing for financial analysts. Not licensed? Don't worry. In most cases, your company must sponsor your licensure. That means companies don't require licenses in resumes for financial analysts. Pro Tip: Don't be ashamed to list your CFA twice. Put it once in the certifications section, and once in your title. He's rubbing his eyes. He's looked at so many resumes for financial analysts that "responsible for" is burned into the lids. By now, he can't tell one resume from the next. They all show similar skills, certifications, and experience. But suddenly he sees yours. Your secret? The "other" sections that you added. Interests, Hobbies, Awards, Conferences, Languages, Activities, Courses, Publications, and Licenses all make great extra sections for a finance resume. They don't all have to be directly related to financial analysis. But they must paint the picture that you're the best candidate for the job. I'm very interested in wine tasting. It doesn't give any insight into work ethic or ability. Seeking Alpha, "Uniform Adjusted Financial Reporting Standards vs GAAP"
Harvard Business Review, "An Erosion in Earnings: The New Finance"
The Economist, "Why We Need a New Standard in Business Valuations"
Weekly podcast on investing, 1,200 subscribers. Member, Chartered Financial Analyst Institute. If you're trying to make the CEO take notice, that last resume sample will do it. What do financial analysts do to build a list like that? They sit down and list their interests, awards, publications, and other selling points. Then they use the ones that fit the job offer at hand. You can even add a hobbies section. Almost no one does it, but it works so well. Reading books about corporate finance analysis. Throwing Cashflow 101 dinner parties. Informal finance analyst meetings at the SoHo Cigar Bar in NYC. Are those hobbies "must-haves" on a financial analyst resume? Clearly not. But this recent graduate is definitely on the lookout for a high salary job in finance. Pro Tip: Resist the temptation to put all your "other" achievements into one catchall category. Differentiating them draws the eye and creates traction. For more tips to give your financial analyst resume Benjamin Graham status, see our guide: "+20 Best Examples of Hobbies & Interests To Put on a Resume (5 Tips)"
Cover letters are a waste of time. 60% of recruiters don't read cover letters. But 40% consider them essential. Since you don't know which is which, you need to write a good one. Take the best wins from your resume. Weave them into a brief, compelling story that shows why you'll fit the job like a bespoke Armani Collezioni. Call the CEO or recruiter by name. Refer to a fact or two you love about the company. Add achievements that show in concrete terms how you can help. Finally, wrap it up with a call to action. Make it as simple as, "I'd welcome the chance to talk more with you about your needs." Pro Tip: After you send your financial analyst resume, follow up. A follow up email in a few days can be the one thing that puts you top-of-mind. Want to write a financial analyst cover letter that makes the CEO say, "Wow?" See our guide: "How To Write A Cover Letter [Complete Guide With Examples]"
Adding contact info to your resume isn't necessarily a no-brainer. Yahoo is out. Likewise MrFunBoy389995@Hotmail.com. Add links to your LinkedIn profile, your portfolio site, or your Twitter handle. Most recruiters find new job applicants exclusively through LinkedIn. So pay as much attention to your LinkedIn profile as your financial analyst resume. See our guide on optimizing your LinkedIn profile for tips. Pro Tip: You can botch a flawless resume for a financial analyst with one embarrassing Facebook photo from that cocktail party 7 years ago. To avoid that, see our guide to cleaning up your online presence. Need more help to write the best professional financial analyst resume you can? See this guide: "How to Make a Resume: A Step-by-Step Guide (+30 Examples)"
Custom-fit your financial analyst resume to the job offer. Build a master list of your achievements. Pack your resume with metrics that fit the job description. Don't just list your skills in your financial analyst resume. Prove them in your experience and education sections. Add extra sections like Conferences and Publications to show you're not just another pretty face. Got questions or ideas about making a professional resume for a financial analyst? Give us a shout in the comments section! A complete guide to writing a resume for data analyst. +20 examples to show you how to write a data analyst resume. Use our resume sample and a template. A complete guide to writing a resume for business analyst. +20 examples to show you how to write a business analyst resume. Use our resume sample and a template. An accounting resume sample that gets jobs. Get 20+ great examples and job-winning tips from our experts. Read our complete guide to writing a professional resume for accountants. Highlight your accounting skills and achievements, get a lot more interviews, and kick-start a new career!